We are pleased to introduce the Janser JANBOARD, the indestructible dual purpose kneepad and transport platform. This rolling kneepad is ideal for all installers who work on their knees at floor level, whether you're a tiler, floor layer or builder, everyone will love the use of this transportable kneepad platform! The JANBOARD offers optimum mobility on the job, ensuring greater working efficiency, saving you time. 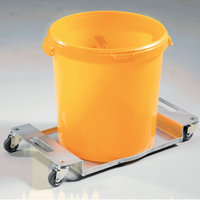 As a duel purpose tool, the platform can either be used as a "floor-glide", to transport platform for buckets, tiles and other materials, offering extreme stability, or as a heavy duty cushion pad, designed to protect your knees (removable). It has a loading capacity of 150kg, and measures 40cm x 30cm. If you wish to find out further information about this product, simply submit an enquiry or contact our team today. Supplying professional machines and tools to the flooring and associated industries for over 50 years.